There were a few more activities that I left out of the last post. Last minute things to do before we move on to other islands. 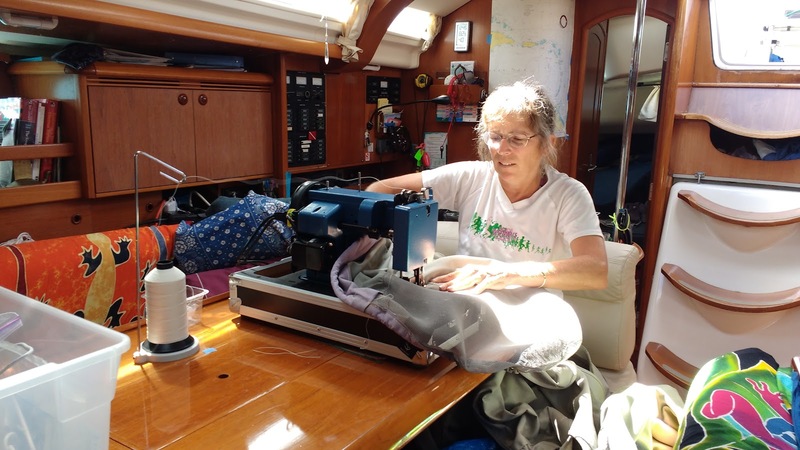 Although not BVI specific, one of the things I did was to learn how to use my new heavy - duty Sailrite sewing machine. This machine was bought specifically to repair our sails. They had ripped once before (you can read about that here). We got the sails repaired professionally then but there were some seams that were starting to go. The plan had been to purchase the sewing machine to save money on repairs. Sometimes the best laid plans go awry. Shortly after becoming full time cruisers we purchased new sails. Now we don't need the sewing machine for sail repair (we hope, for quite a while) but there are other projects that it can be used for. Our friends Robin and Mike on Mermaid had some dinghy chaps (covers) that needed to be fixed. Robin had the sewing knowledge I needed, I had the machine she needed, so she brought the chaps over and we worked together, setting up my machine and repairing her chaps. A win - win situation! The other activity was much more BVI specific. We attended a "Happy Aar " concert at Leverick Bay with Robin and Mike. The performer was Michael Bean, and he does a very good job of getting the audience participating. Before the show he came around to every table and had anyone who wanted try Conch Blowing. I had never tried before, but found it surprisingly easy. The end of the conch is cut off, leaving a hole to blow through like a brass instrument. At the end of the show Michael called audience members up for a conch blowing contest. Four Categories, boys, girls, Men and Women. I decided to give it a try, and was very successful. 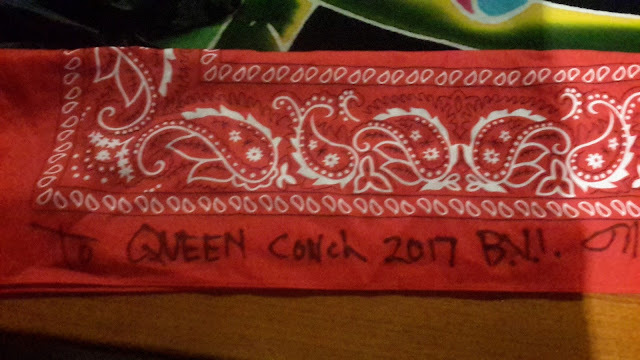 I am now to be referred to as Queen Conch, or Your Royal Conchness having one the title fair and square! Hail, Your Royal Conchness! Long may you reign! Thank you, Thank you. I would like to thank all the little people who made this possible. Yet Another Day in Paradise? Would you like the red sweater or the black?